After my blog post from the perspective of an organizer, here is my barcamp experience report as an attendee. Around 40 people gathered on this Saturday and the barcamp started. Stephan Roth did a great job to introduce the Open Space format and soon after we started writing and presenting our session ideas. The board filled up nicely and we started the sessions soon after. The room layout of the oose campus was good, they were easy to find and enough to host several sessions in parallel. There were even some overlapping sessions, but we shuffled them around in the time table and it worked out. I also put two session topics up, the Testsphere game and one about external effect and Community of testers. Testsphere is a physical card game, designed and developed by Beren Van Daele (@EnquireTST) and MoT. I met Beren on the Rumanian Testing Conference (RTC) 2017 and he was so kind to give me one set; which saved me the pickup, after ordering it here. As an after-lunch activity it was great to avoid lunch stupor and also to connect people and get them talking. Christian Kram also used it in an Agile Games context, you can read more on his blog. In the morning I wanted to talk about what other testers do and use to increase the appearance and reputation of Testing / QA . There are still misconceptions and bad feelings and understandings what non-testers think about us. I was curious if there are other types of activities I have missed so far, which could help to show a better image of us testers. It is not enough to “just” do good work, but we also should show case this outside of our teams or departments. That is one of the reasons I invented the Software Testing World Cup (STWC); to show to some greater audience how testing can be fun, can be learning and doing quality work at the same time. 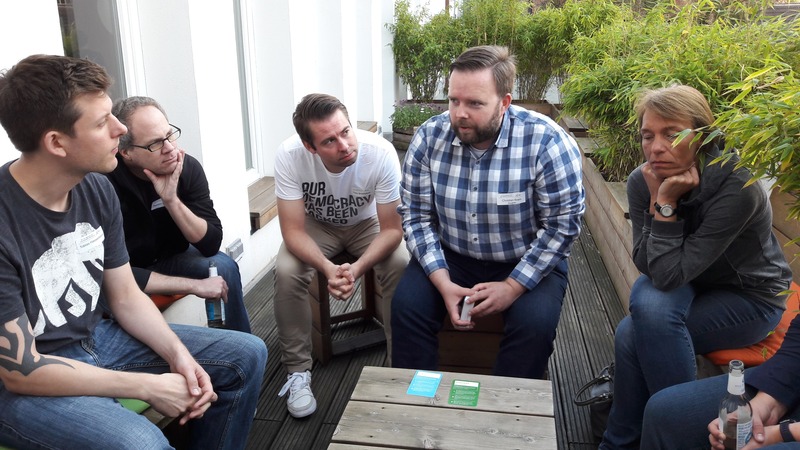 I often initiate such events with my clients as well, be it internal test competitions or a 20daysoftesting (here is a nice overview from a XING QA colleague). Interestingly my intended session was going in a different direction and outcome, so I leaned back and let the energy of the people take it over. It was a good discussion and one takeaway was the German “Tue Gutes und Sprich darüber” (~do good and talk about it). Since my passion is learning and supporting others I am always up to share and interact, so this session was very much to my liking. I joined late (Law of two feet), but Christian Kram did a very good job in mind mapping and facilitating this session from the results, which were already on the flipchart then. Since it was a common request, he also put up a blog post, where people get some starting points where to find reading material around testing, you can find it on his blog. The final session I attended that day was a gathering to think about what we attendees thought about the barcamp and if we should repeat it. In less than 30 minutes, the QS -Barcamp 2018 was drafted and decided. It will be the first full weekend in September, it will be in the same frame as this one (oose campus, open space, less than a handful sponsors, maximum 80 attendees). One addition we want to more actively communicate, is the openness for sessions in English, I think we excluded involuntarily our English-speaking colleagues. I think, this energy and resolution speaks for it self. That concludes my barcamp experience report, I am very much looking forward to next year. Thanks for letting me being part of it.